Welcome to my "everything else" blog where I can share my other creative interests like baking, crafts, writing, well you get the picture! To see my fine art please visit my website www.marymcandrew.com and remember my paintings are for sale there. Or visit my shop at: zazzle.com/marymcandrew* for prints, note cards and other gifts. A pile of cookies waiting for tea time! 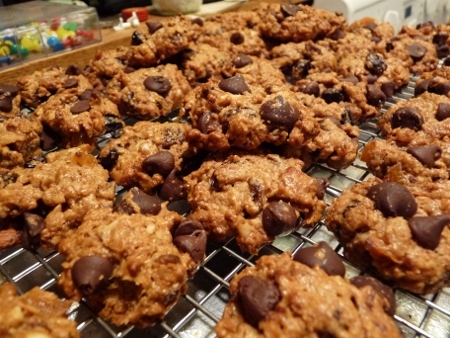 These cookies use no processed sugars just honey and no wheat flour, just oats! If you are cutting down on gluten these are perfect, if gluten is a serious issue for you, only use oats that are labeled “Gluten Free”. I don’t have any health issue with gluten, just trying to cut down on it, so I use regular oatmeal. OOhhh look at all those chocolate chips! 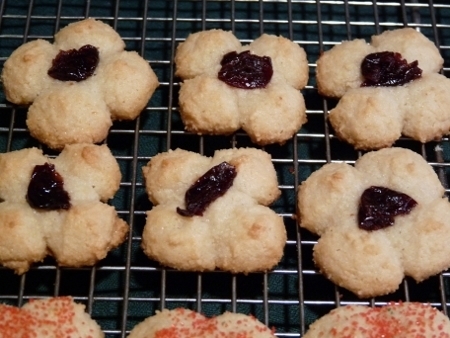 1 ¼ c raisins, dried cranberries, apricots, dry cherries etc. Put first 5 ingredients in a pan and heat on low to melt. Stir often to wet the oats and heat. Start mixing dry ingredients in a big bowl while the oats and honey heat. Remove oats from heat, put in glass bowl then in fridge or freezer to cool down just so it’s only warm. Mix egg into cooled honey oat mixture then mix into dry ingredients to form sticky dough. Drop onto lightly greased pans, push down a bit. It is very sticky, try to use spoon to scoop and then just touch with fingers to push into mounds. I do a bunch while waiting for first batch and put them on cutting board, they dry a bit and you can pick them up to put on cookie sheet, press down a bit after. Bake at 325 F 10 min. then turn pan bake 4 min. more. Let cool a tiny bit on pan then remove. These taste so buttery and crispy, I’m really happy with them! I put too many chocolate chips in the ones pictured (is that possible?) because they kept wanting to fall apart before they were baked! So keep the chips to 3/4 c if you use them at all. I added the coconut oil to cut down on butter amount, I imagine you could use all coconut oil, but won’t have the same buttery taste. Add whatever dried fruits you want. I think if you sprinkled little blobs of this dough all over the cookie sheet, and bake for less time, it’d make a wonderful snack to munch on! 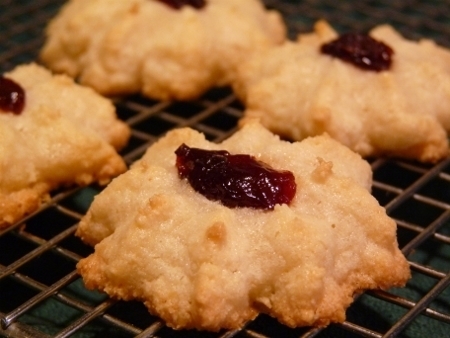 A very yummy , sweet, crispy, light and chewy all at once cookie! Well in England it’s known as a biscuit but all I know is it’s very easy and very special, perfect for tea time. Made simply from almond meal, sugar, egg whites and almond essence. These clover shapes were made using a different plate. I read that these were “popular accompaniments to a glass of wine or sherry at routs or fashionable gatherings in the 18th and 19th centuries.” It comes from Middlesex England. Your supposed to put a bit of glace cherry on top but I hate them, so I used dried cherries. Crisp on the outside and chewy inside. I made some using a heart shaped plate. You can easily try different shapes by just changing the round plate on the end of the press, no need to empty the it first. 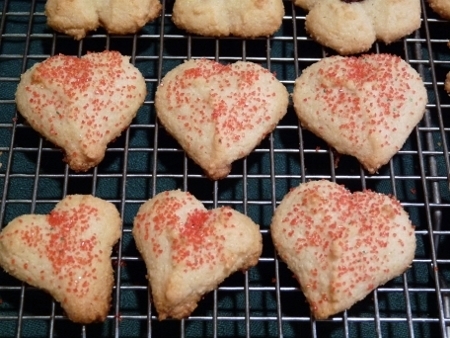 I made these heart shapes, depending on how much dough you squeeze out will make them fat or thin. 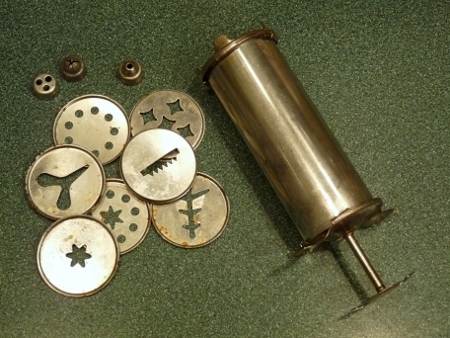 My old dough press, love it! I bought this old press at the thrift store or a garage sale and I love it. It doesn’t have all the parts but I can still use many of the plates. Some are a bit spotty-old but that doesn’t hurt anything. This is the press with the plate in it, and dough. This is what the press looks like on the end the dough comes out, I have the ‘star’ plate in it. Three plates and the cookies they make. 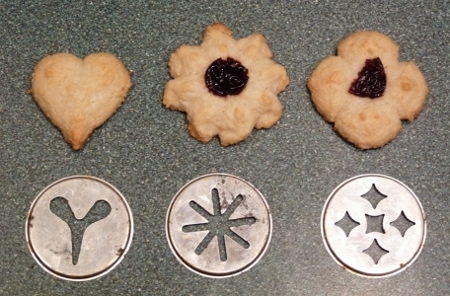 This shows the three plates and the cookies they make, a heart, star or blossom and what I’d call a clover. The blossom or star is great for putting a bit of jelly or fruit on top and I guess the clover is too. Golden and hot from the oven! 2. Mix sugar and almonds, you can weigh them into the same bowl. all up into the almond-sugar. If you’re using up egg whites from other recipes, just measure out the 5 1/2 T.
a sprinkle of colored sugar if you like. I didn’t glaze with egg but maybe I’ll try if I start with whole eggs next time. 5. Press or pipe directly onto greased sheets and press pieces of dried cherry or glace cherry into tops if you like. You can also sprinkle with colored sugar. Bake 8-10 min, until golden all around edges. Some of the dough in the bowl. Here’s some of the Rout Biscuit dough in the bowl, waiting for the press. A note from me, I have never had a ‘Rout Biscuit’ before so I wasn’t sure the consistency of the dough. I’m not sure if it should be stiffer, resulting in a less puffy biscuit? All I know is they tasted dandy! 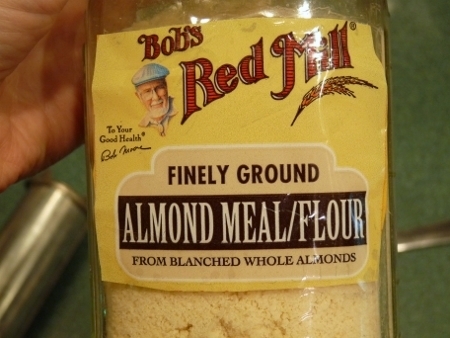 Bob’s Red Mill almond meal flour. I bought this at my local ‘Tops’ grocery store in the organic section, but it was EXPENSIVE! More than $10, yikes! Lots of Rout Biscuits waiting to be sampled. 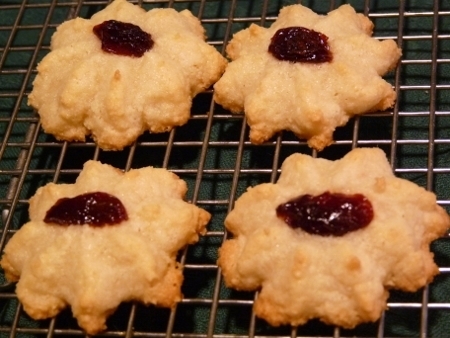 These biscuits (or cookies) keep well in a tightly sealed container. 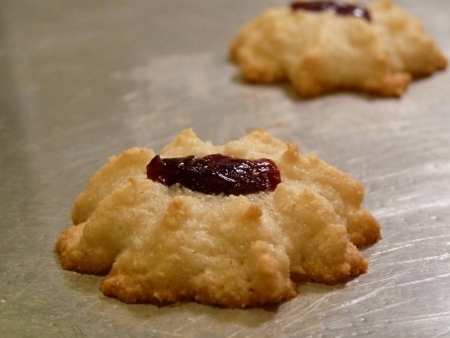 Have you ever made Rout Biscuits or eaten them? If so please leave me a comment about them. Below are links to glossy cards I made with the recipes on, you can keep them or send them! 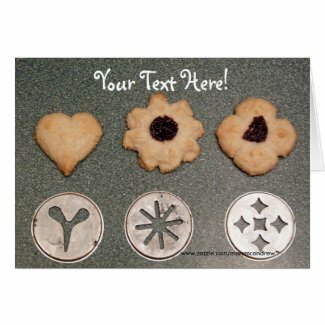 It’d be fun to mail this to a friend who loves baking! Maybe a birthday or to drop a hint that you want cookies! This is what I believe is an old traditional recipe, I adapted it from a blog post here. 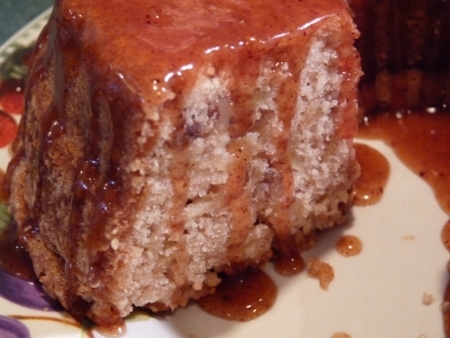 I dropped some of the oil and used applesauce, I also topped it with my own cinnamon sauce creation, SCRUMPTIOUS! Still warm from the oven, I couldn't resist cutting it! 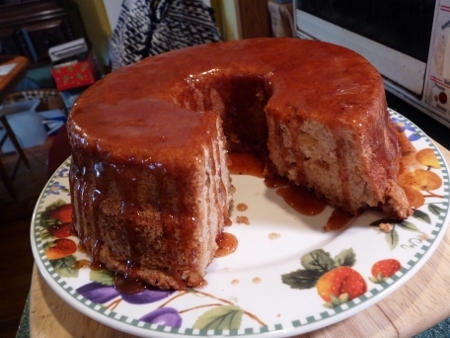 You don’t need any glaze really but you can make up a simple confectioners sugar, milk and vanilla glaze if you want. Is that piece for me? I don't mind if I do! It makes a nice big cake and is SUPER easy to make! A good one for beginner bakers. A warm slice cut...filled with moist apples. Gather your ingredients together; this cake is made with just a few. 1. Peel and chop about 3 apples, 1 1/2 c or more, using tart apples. Set aside. Grease and flour your pan now too so it’s ready. 2. Mix s.r. 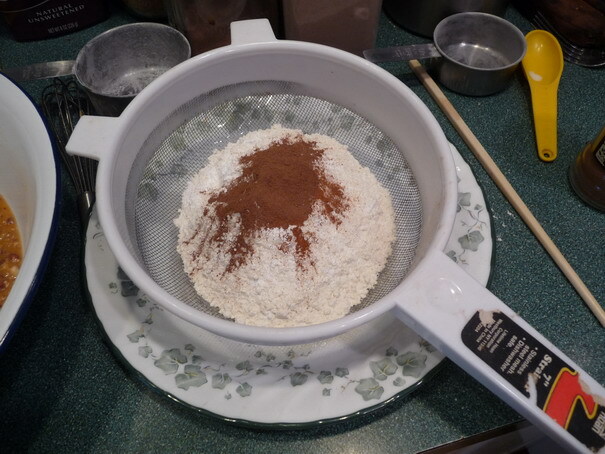 flour, sugar, cinnamon in a bowl with a whisk. Add nuts and or raisins now if using. 3. 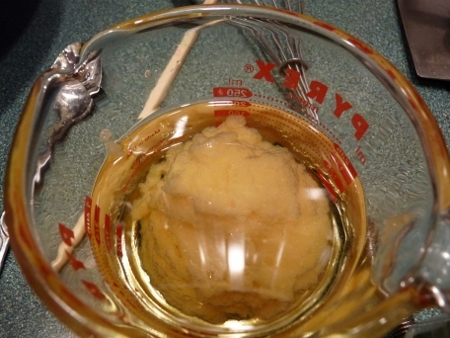 Measure oil into large glass measuring cup then add spoonfuls of applesauce to make the level rise to 1 c. Now add two eggs and carefully mix eggs in well. (Saves getting more cups dirty!) Add to dry ingredients and mix. Oil and applesauce in measuring glass. 4. 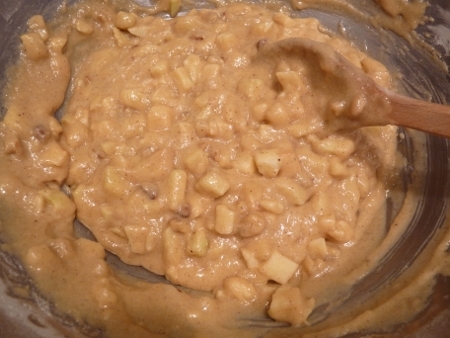 Add apples and finish mixing by hand; it’s a thick, heavy batter. The Apple Cake batter is thick and heavy. 5. Spoon into well greased and floured bundt or angel food pan. 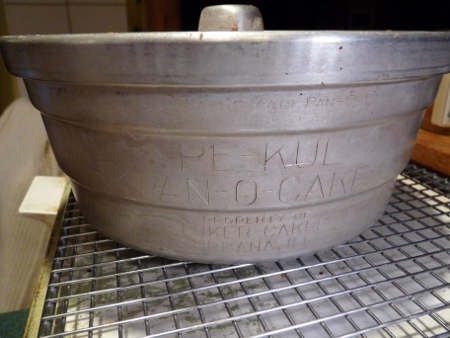 I used an antique pan called “Re-Kul Pan O Cake”, I LOVE that, Pan O Cake! haha…More about that later. My "Re-Kul Pan O Cake" pan. 6. Bake at 350 F 45 min – 1 hour. It comes out with a nice sort of crust on top, I think because of the sugar in it. Let cool 10 minutes in pan then remove to rack to cool by turning upside down. 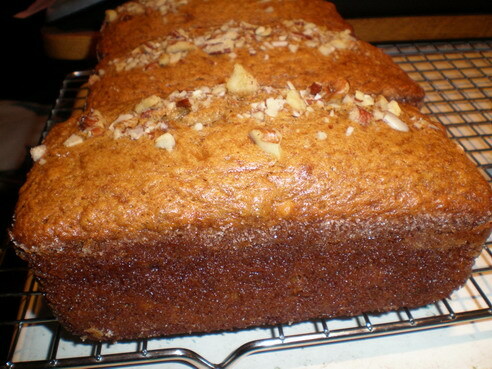 Or after removing, put on plate and drizzle with glaze made from confectioners sugar, milk and vanilla. 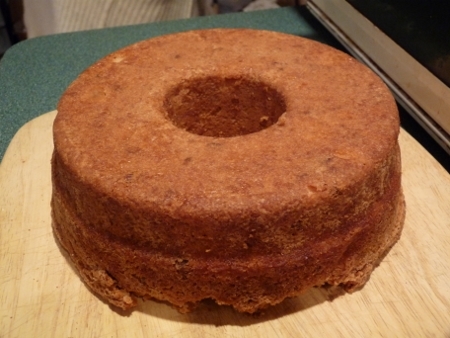 Original recipe said to put it on cooled cake, but I liked putting it on warm, made it all melty. Here it is unmolded and warm. The original recipe called for 1 c oil, I cut it to 1/2 c and added 1/2 applesauce; it was great. Try cutting the sugar back too if you like, I’ll try it next time and let you know how it goes. Raisins are really nice in this! Make sure ingredients are at room temperature, it helps. I bet this would be really good baked in loaf pans too because the top came out with a lovely sort of crispiness. 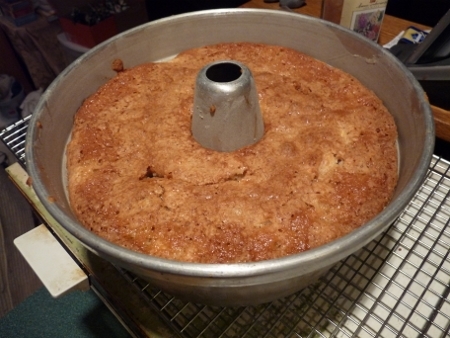 I also baked this as a half recipe in a 9×9″ pan, plenty for one or two! Gosh don’t you just love an easy recipe that comes out so great?! So you’re wondering about that pan? Well I bought mine at a thrift store, must be ages ago, and never used it. When I was cleaning out my lower cupboards I pulled it out and thought it was interesting with the writing engraved on the sides. I guess a baker named Jackson M. Luker in Urbana, Illinois, was in competition with another bakery across the street. They started selling angel food cakes cheaper, this made him so mad he left ALL his cakes to sit and spoil. When they sat in the pan so long he thought they were ruined but actually, because of being made with egg whites they formed a sort of hard crust and it kept them quite fresh inside. He had the brilliant idea to offer them this way in the pan and was able to ship them all over the USA. You send the pan back in for a refill cheaper! You could buy one for $2.50 then the refill was $1.25. Read the article here to learn more about this inventive baker: http://www.gourmet.com/magazine/1940s/1947/08/foodflashes . I saw a pan like mine for sale on EBay for $69!! No Way! Then I saw one on a site called “Proxibid” and it sold for $1, so hey, maybe you can find one? 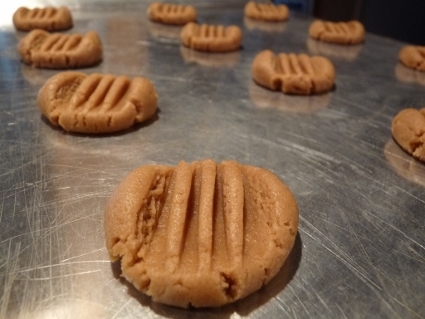 This is a great recipe using my favorite Peanut Butter Cookie dough that was my Grandma Judge’s. It’s perfect for busy mom’s or artists! You use the basic dough without the peanut butter and make several kinds all in the same baking. All very nice, crispy cookies! 1. Cream the shortening and sugars well, then add the eggs and vanilla. Mix well. Wow when I was in England I missed this baby! Had to do everything by hand. 2. In another medium size bowl sift the flour, baking soda and salt. You can sift it first then use a whisk to mix it together well. Now add it to the creamed mixture a little at a time and mix well, if using an electric stand mixer stop once or twice to scrape the beaters and bottom of the bowl, try to resist licking your fingers! 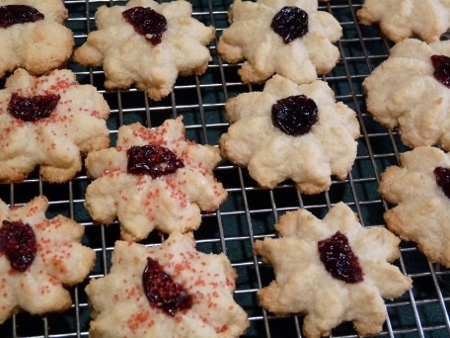 Depending on how many kinds of cookies you want to make will depend on how you divide the dough up. Just using the dough as is makes a nice crispy cookie. Make balls on ungreased cookie sheet, press with the fork in two directions to create a criss cross pattern. If it starts to stick to the dough, dip in water between squishes. Try baking just a few, let them cool and see if you like them. These may spread a little more than when you add the peanut butter. *My mom told me that when my Grandma Judge made Peanut Butter cookies she’d mark them with the fork in one direction (like my pictures) but she’d criss cross the fork to make Butterscotch cookies and they were Grandpa Judge’s favorite! 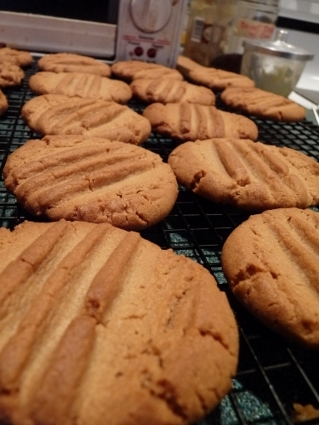 I never ever had a recipe for these Butterscotch cookies but because I like to experiment in the kitchen, I tried baking some of the dough without the peanut butter, thinking maybe that’s what Grandma did…well I was excited to discover that it worked and I think it’s just what she did! I love learning about that kind of family history and I think about them every time I make these butterscotch cookies, making the criss cross. 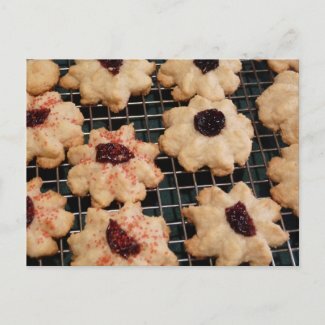 I never knew my Grandpa but I think of him all the same when I bake these. 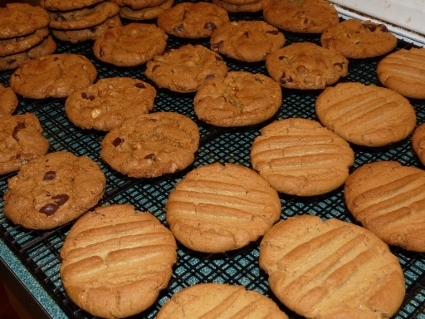 Ohhh Yummy Peanut Butter Cookies! 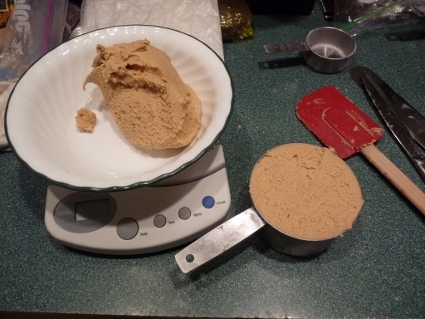 For every 1 cup of dough (9 oz), you add 1/4 c of peanut butter; just scoop out 1 or 2 cups of dough and put in a small dish for now. After I mixed the chocolate chip cookies, I used the mixer bowl and just put this measured dough back in, added the peanut butter and mixed well. I used 2 cups of dough so I added ½ c peanut butter. Make balls on ungreased cookie sheet and squish gently with a fork. If it starts to stick to the dough, dip in water between squishes. *Try whatever nut butter you want. I experimented once with ground sunflower butter, almond butter, and I think tahini (sesame seed), all as separate cookies. The sunflower one was strong flavored, I think the almond was nice…a good thing to know if you have someone allergic to peanuts! Hey it’s not rocket science! Whatever you have left in the mixer bowl you can throw nuts and chips in till it ‘looks’ right to you. 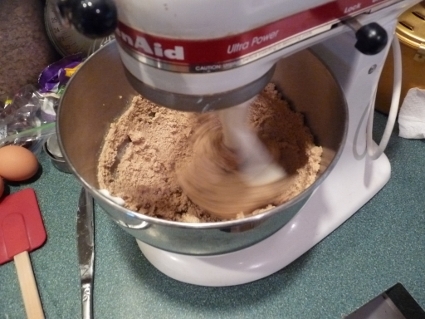 If you want to make other types of cookies take some dough out now and put in another little bowl. 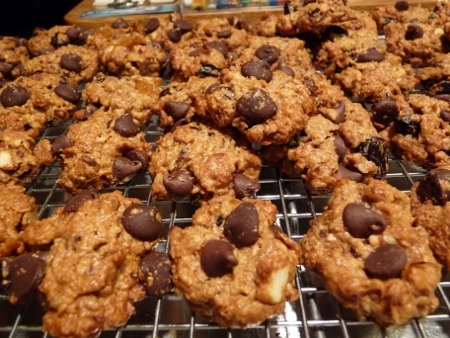 If you took 2 cups of dough out for the peanut butter or other cookies then add 1/3 c chopped nuts and ½ c chocolate chips. (both were heaped a bit). 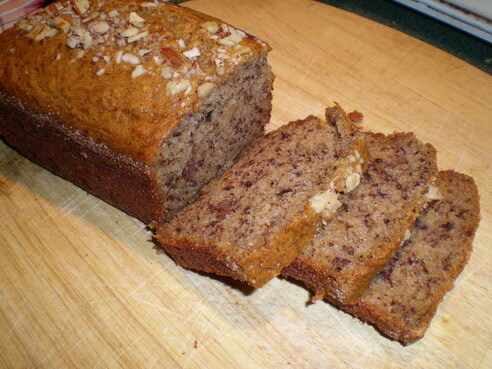 You can use walnuts or pecans. You don’t have to make balls, just pick up blobs of dough with your fingers and pinch off rounded pieces that ‘feel’ about right. Put on ungreased cookie sheet. Chocolate Chip Cookie Dough....oh tasty all by itself! 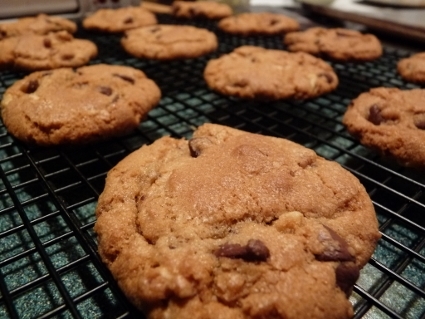 Ok, so if you’re like me you know that every cookie is better with chocolate chips in it! 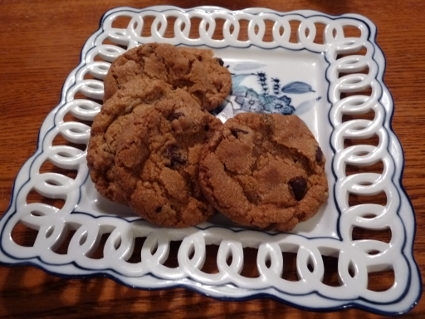 You can make these without the chips if you want but think of how easy it is to use half the chocolate chip dough, add some more stuff and you have another type of cookie! When I bake again I’ll do some measuring so you’ll know exactly how much spice and oats to add per 1 c of dough. For now just bake a bunch of chocolate chip cookies then with the dough left in the bowl, throw in some oatmeal flakes, raisins, a good shake of cinnamon and a little shake of nutmeg. 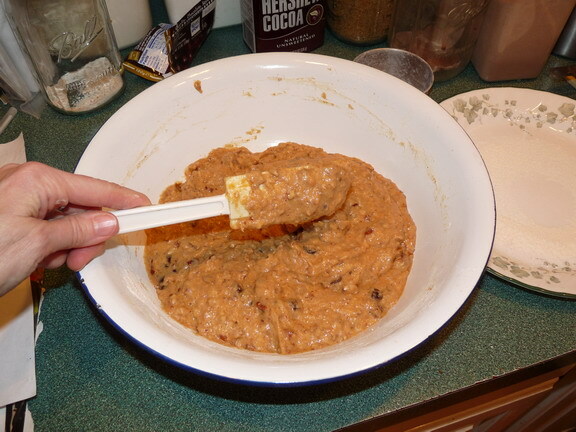 Look at the amount of dough you have and add about ½ that in oats, ¼ that in raisins. Really just do it till it looks right, but if you add too much the dough won’t hold together. Not to confuse you but if you also want to add peanut butter to these, leave out the spice and ohhh they’re yummy! Form balls with your fingers and hands, pinching off same size pieces and pressing together if it’s crumbly. Put on ungreased cookie sheet. Bake at 375 degrees for 10-12 minutes. *After the first 10 minutes I turn the cookie sheet around to help front and back bake evenly, then finish baking till golden. Don’t overbake. 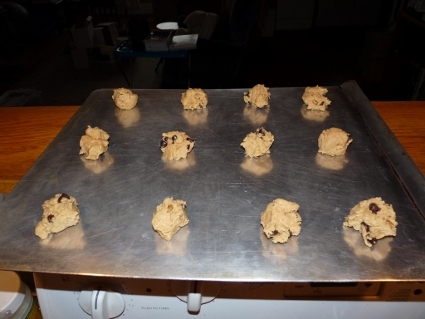 Remove from oven, pop next sheet of cookies in that you have ready and waiting, then remove them from the hot sheet. This way you keep things moving along. 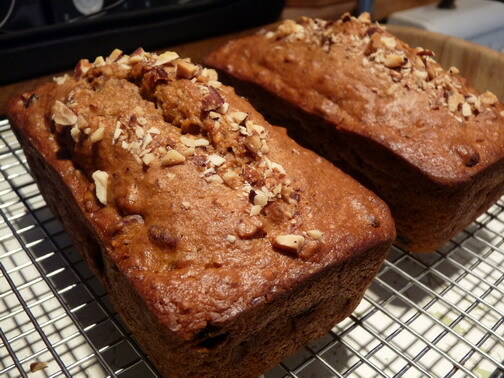 This recipe makes either two large (7×3″) loaves or what I prefer, four small loaves. It’s nice and moist! Sliced and ready for butter! 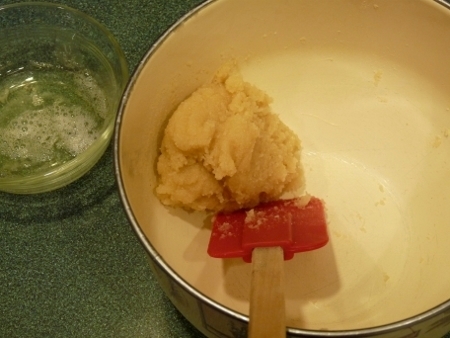 6 Tablespoons or 3/4 of a stick butter, softened. 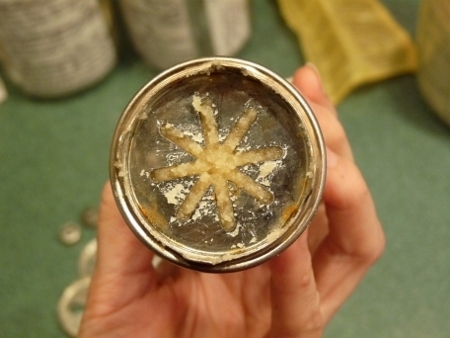 Cinnamon and sugar to dust pans = about 1/8 c sugar + 1/2 tsp or more of cinnamon. I keep a small jar of cinnamon sugar in the cupboard, I don’t measure the cinnamon really, just add and shake until it ‘looks’ right! 1. Turn on oven to 325 degrees F, grease your pans (I used veg. 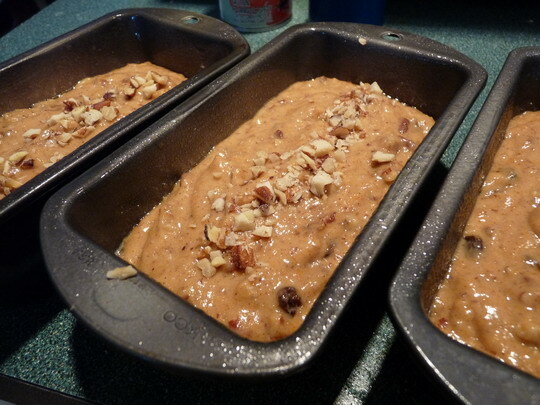 spray) then pour the cinn/sugar mix into the pan and tip around to coat all sides and bottom. This is optional but makes a nice touch. 2. Cream butter and sugar well, mix in eggs, then mashed banana, sour cream, vanilla. I like to make things by hand but I found this was just easier to put in the mixer and let it go while I did things, nice and fluffy! 3. 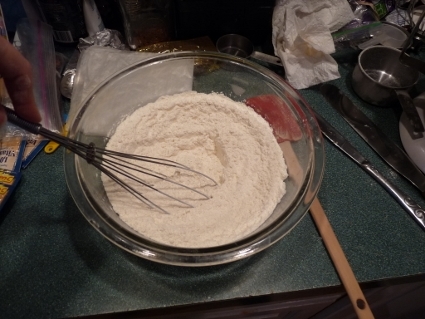 Mix the dry ingredients, flour, salt, baking soda and cinnamon in a bowl using a whisk. Add to mixer then add the nuts. If someone in the family doesn’t like nuts, leave them out for now, put some batter in one pan, then add some nuts to the rest! I do this all the time when I want to experiment with adding ingredients; I think raisins or chocolate chips would be nice in this recipe! 4. Sprinkle some chopped nuts along the top center of each before you put in the oven, it really makes them look sooo nice when they’re done. Bake one hour, center rack of the oven. Warm from the pans...ooo smells so good! This bread is so moist you don’t need to butter it, BUT it DOES taste really yummy with fresh, creamy butter! Where’s my cup of tea? 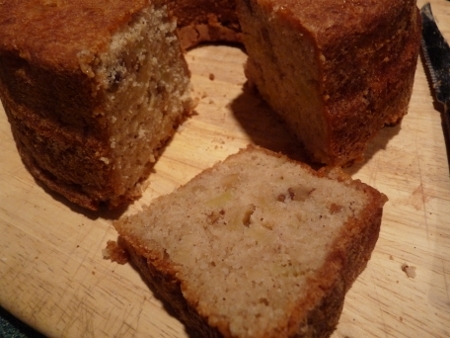 It’s time for Banana Bread! When cool I like to take two small loaves and wrap them with wax paper, then wrap with a few layers of plastic wrap then pop them in the freezer, or give a fresh loaf to your neighbor who just snow-plowed your driveway!! 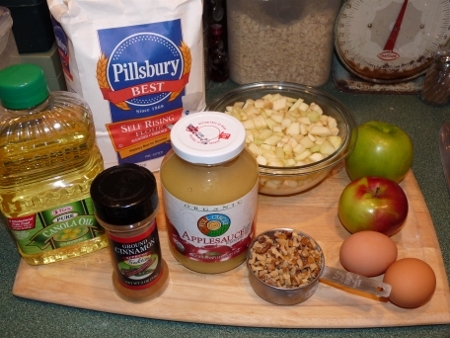 I keep a small jar of chopped mixed nuts by my stove for adding into oatmeal. 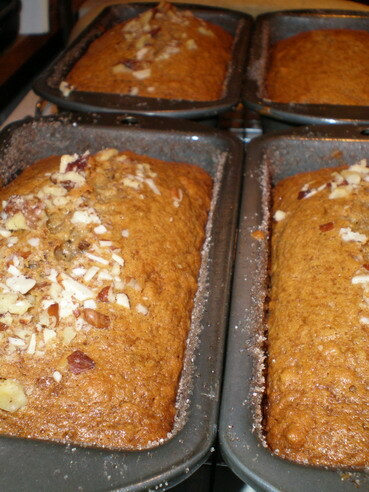 It’s great to sprinkle on your quick breads like this; my mix is pecans, walnuts and almonds. 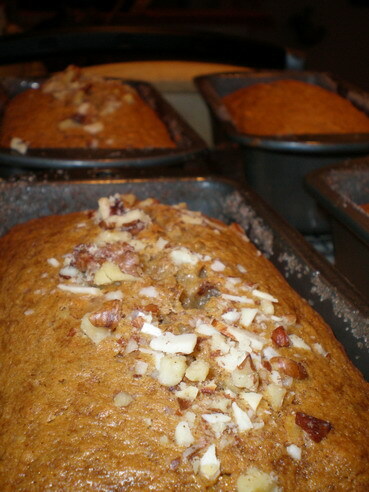 You can also top with this mixture: 1/2 c brown sugar, 1/2 c flour, 2-3 T butter (soft), 1 tsp cinnamon, 1/3 c walnuts. Don’t overload tops if doing muffins, it weighs them down, but it tastes sooo good! Makes more than enough. 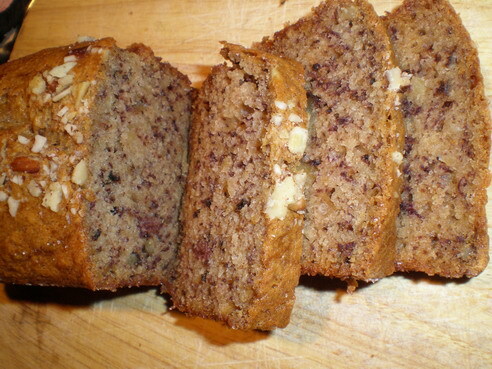 This bread is also good with chocolate chips added and / or raisins. The original recipe called for 1 1/4 c sugar, I decreased it to 3/4 c and think it tastes fine. Also I increased the vanilla and cinnamon from 1 tsp to 2 tsp. If making into muffins, bake for only 35 min or so. If your low on sour cream you can use yogurt or top off with a couple spoonfuls of mayonnaise! Yup you heard me right, I actually like to add it for more flavor! But don’t tell the family, just do it. 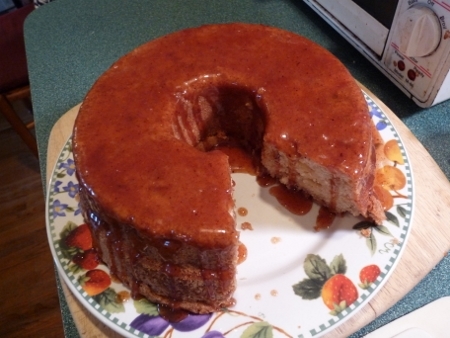 I got this recipe online awhile ago, from “Your Guide to Southern US Cuisine”, I only changed a few steps.It’s low fat which is nice but seems to have it’s share of sugar. I changed it to be made in one bowl, very easy! 1. Preheat oven to 325F and grease either one large loaf pan or 3 small ones. 2. 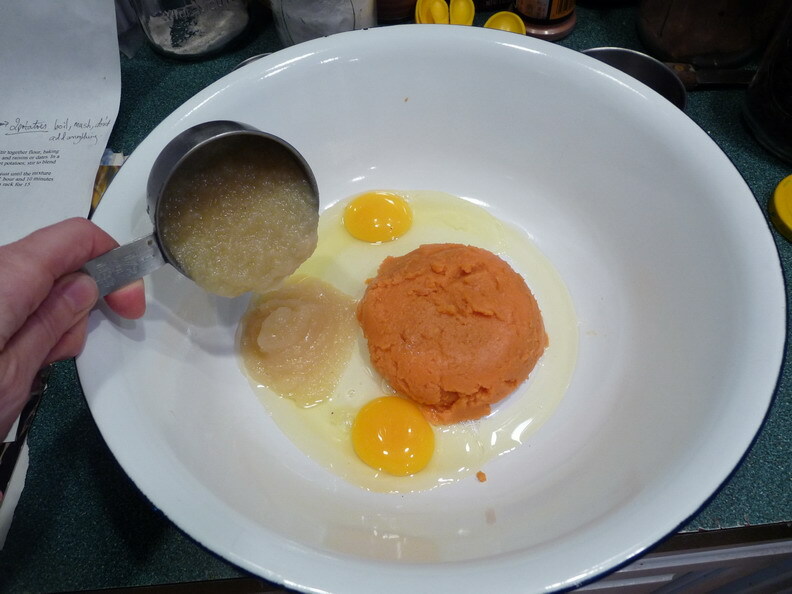 Boil two sweet potatoes then mash, don’t add anything to them then let it reach room temperature. did them in the bowl by tipping it to one side from the other ingredients, then mix it all up. Looks messy and yuchy! Add sugar and mix well. 4. 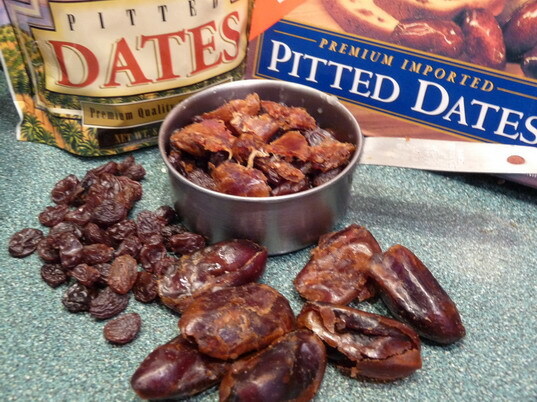 I used some of each the raisins and dates, just tear the dates up with your fingers, quite a sticky job!, then add to batter. 5. 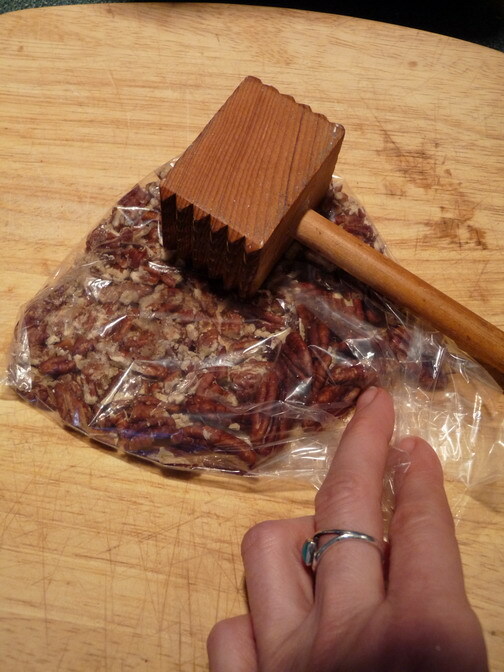 Crush pecans using a mallet, heavy cup or rolling pin by putting them into a small plastic bag then whacking them on a cutting board. Then fill measuring cup and add to batter. Use a rubber spatula to mix the batter well, scraping sides all around and folding into centre. 6. 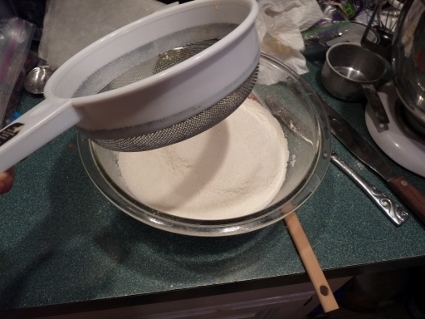 Place your sifter or mesh sieve on a plate and gently put the dry ingredients in there as you measure them. Sift it on top of the batter and mix in with spatula. 7. Spray pan(s) with cooking spray or grease with shortening and evenly distribute the batter in pan(s). Use your spoon or spatula to pat the top of the batter to make it spread out evenly in the pan. I sprinkled chopped nuts along the centre top before I put them in the oven. 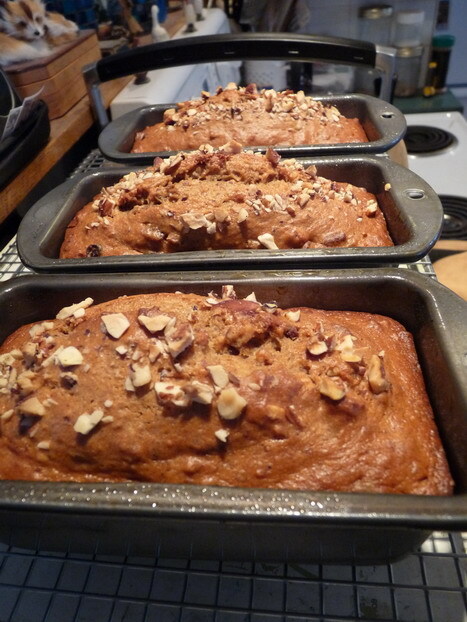 You can either bake one big loaf or three small ones, the original recipe said one loaf, but there’s a lot of batter! 8. Bake 1 hour plus 5-10 minutes at 325 F then remove and cool for 15 minutes on a rack. Remove from pans when you can stand it no longer (the wait I mean!) and let cool the rest of the way on rack. How long can you go before cutting it I wonder? 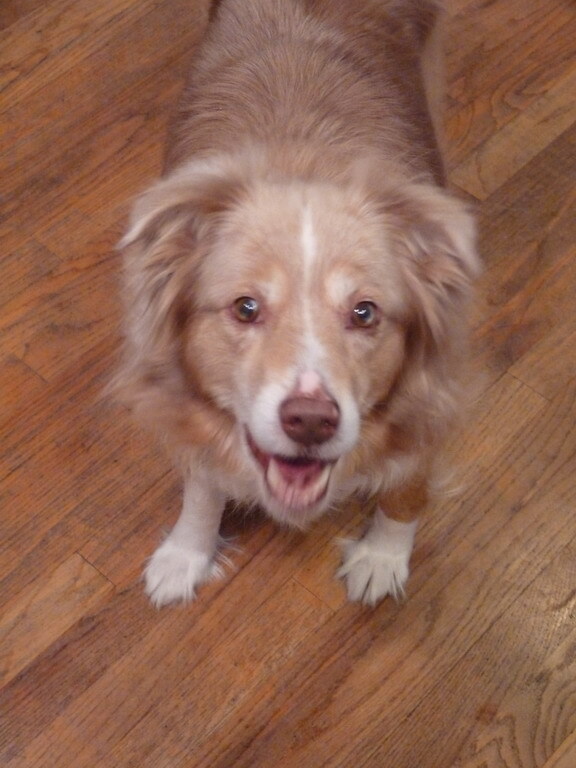 Ginger say's how much she loves Sweet Potato Bread! Note: I just brewed some hot tea and cut a few slices, put some butter on, and it’s very good! I think I’d throw a bit extra raisins and dates in next time and maybe even some more cinnamon. You can almost smell the applesauce and I wonder how it’d be with bits of chopped apple in it? Always something new to try!